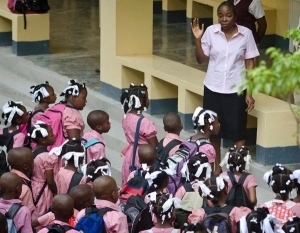 Because of the quality education available at each of the schools and the lack of public education in Haiti, parents are eager to have their children attend. Each school receives many more applications than spaces available. The education the students receive gives them the opportunity to develop and enhance the talents the Lord has given them. Not only are the children learning educational subjects such as math, history, French and English, they also receive Biblical lessons. We are a Christian ministry; the educational programs are extensions of that. The students are able to spread the Gospel to their families and be a light for Christ to those around them. Education is a critical component for life success in a developing country like Haiti. The sponsorship program makes the educational goals of HOM possible, as parents are only able to pay a small portion of the cost if anything at all. Supported by sponsorship donations, all students receive academic instruction in a Christian environment, a hot lunch, vitamins, books, classroom materials, health care exams, and Christmas and birthday celebrations. After leaving our primary school, students may continue their studies through secondary school, college and trade or vocational schools. The cost for sponsoring a primary school student is $35/month.